Al Bait Sharjah ... inspired by Emirati heritage. Sharjah’s latest five-star resort aims to take guests on a trip down memory lane, while preserving the heritage of the UAE emirate, says ABDULAZIZ KHATTAK. A five-star luxury resort – among the first inspired by the rich Emirati heritage and culture – has opened recently in Sharjah, UAE. Al Bait Sharjah is a 53-key boutique resort in the AI Mareija area of the ‘Heart of Sharjah’ – an ambitious historical restoration project, which follows traditional Sharjah architecture and is built upon the original foundations of old houses that once belonged to the most esteemed families in the country. Al Bait, which translates to ‘The Home’, is part of an Emirati conservation project in Sharjah spearheaded by the Sharjah Investment and Development Authority (Shurooq). The property is housed in a collection of heritage houses once owned by local families closely intertwined with Sharjah’s history. The boutique property, valued at Dh200 million ($54.45 million) is home to 53 luxury rooms and suites, and a range of facilities and amenities including an array of dining offerings inspired by Middle Eastern and Far Eastern cuisines, a luxury hammam, a helipad for the ultimate arrival, a fleet of 2019 Mercedes and an iconic 1967 Mercedes Pullman limousine. It also features a museum and a library, with stories and archives on Sharjah’s history, and the history of the Al Midfa and Al Naboodah families, who shared a significant influence and presence in the emirate since the 1950s. Architectural firm Godwin Austen Johnson was assigned to redevelop the five historical buildings: Bait Ibrahim Al Midfa – The Library; Bait Eissa Al Midfa – The Reception; Bait Abdul Rahman Al Midfa – The Heritage guestroom block; Bait Abdullah Al Mahmood – The Arabic Restaurant; and Ibrahim Al Midfa Majlis – The Café, with the aim of respecting the heritage area and buildings and maintaining the traditional urban fabric of the old Sharjah city. He continues: “In order to give guests the true feeling of the heritage aspect of the development, the rooms have been kept to the specific proportions of the old village homes – governed by the availability of structural timbers – with limited openings for privacy and timber ceilings. In keeping with the homogenous nature of the traditional buildings, the material finishes have been kept to a certain colour and finish with the rougher textures blending into a smoother more luxurious finish for the interiors. Gavin says this enables the resort to look like it belongs within the existing urban fabric whilst retaining the luxury and expectations of an upscale property. Links between the blocks of rooms and the main building housing The Restaurant, fitness centre spa and pool, are via the public streets on the ground level or via connected walkways at first floor level. The interior design approach for Al Bait Sharjah was split into two distinct treatments, based on whether the rooms are part of the historic renovated buildings or part of the new insertions. “In the heritage rooms, the traditional ceilings, complete with plaster cornices, have been used as well as timber shutters and doors. In the new rooms, the finishes are a little more refined and pared down to create more of a contemporary take on the traditional materials,” Gavin elaborates. Coloured rendered plaster walls are topped by decoratively patterned plasterwork and cornices and polished concrete floors that replicate the traditional clay floor provide a smooth homogenous finish. Statement pieces include hand-carved decorative timber furniture such as four-poster beds and decorative trunks, and every room features carefully selected traditional Emirati fabrics, patterns and ornaments. Lighting is discreet and aimed at recreating the ambiance of the old village rather than simply illuminating the development. The design of The Arabic Restaurant embraces a rich history with exquisite Persian floor carpets, silk drapes, carved timber beams and cornices with decorative Moroccan Zellige tile skirting, polished concrete floors and intricate etched metalwork detailing. 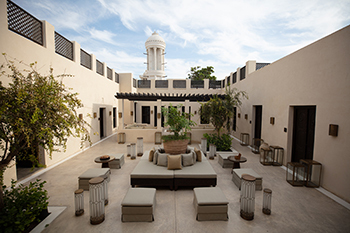 The resort’s casual dining outlet, The Café, leads off an intimate courtyard and features an adjoining majlis area with low cushion seating and decorative floor rugs. The finishes are restrained to emphasise the goods on display. Next to The Café and housed in the most historically sensitive building within the Al Bait complex, the interiors of The Library are minimalistic with chandal and timber ceiling, masculine leather and wood furniture and coloured rendered plaster walls. Al Bait Sharjah was inaugurated in December last year by His Highness Sheikh Dr Sultan bin Muhammad Al Qasimi, Member of the Supreme Council Ruler of Sharjah. The hotel is the latest on General Hotel Management’s (GHM) illustrious international list of hospitality properties. The hotel is connected to various facilities and hotspots in the Heart of Sharjah project, such as Souq Al Arsah and Souq Al Masqoof, through which guests and tourists can have easy access to further experiences in and around the project. GAJ is a 30-year-old UK architectural and design practice in the UAE that has created some of the most iconic buildings in the country. The award-winning and multi-disciplinary architecture, interior design, specialist lighting and MEP practice, has particular expertise in hotel and hospitality, residential and commercial, education, sport and leisure design. The firm employs more than 150 people at its Dubai headquarters with offices also in Abu Dhabi, Sharjah and the UK.